What is Royal Arch ? The brethren of St Luke’s Lodge No 6006 and their many guests gathered at Litherland Masonic Hall, to witness the installation of Iain Beckett as their new WM. For the evening’s ceremony the lodge brethren were honoured by the presence of John Roberts as their principal guest and as the representative for the Provincial Grand Master Tony Harrison. John Roberts (left) congratulating Iain Beckett on becoming WM. John was accompanied to the ceremony by Ormskirk and Bootle Group Chairman Graham Chambers, vice-chairman Malcolm Alexander and grand officer Freddie Wright. The acting and installing WM Ian Gee, started the evenings proceedings off with a very warm welcome to the brethren and guests, before proceeding to open the lodge. Once the lodges initial business was completed, DC Ray Barrow announced that John Roberts was without and sought admission and he was duly admitted into the lodge in a procession. Ian then asked Alan Parkinson to act as IG, Edward Carr to remain in the chair as SW and Joe Cox to remain in the chair as JW. Iain was then presented by the presenting officer Ray Barrow, and after Iain had taken his obligation, Ian thanked the brethren and officers of the lodge on behalf of Donald (Don) Fraser the outgoing WM for all their support and hard work they had given him during his year in office and hoped they would give the same support to Iain. Ian then faultlessly installed Iain according to ancient custom into the chair of King Solomon in an excellent ceremony. The working tools for the third degree were presented by Simon Gray, with the second and first degree tools being presented by Ray Barrow, all three sets of tools were delivered faultlessly. The address to the WM was delivered by Ian and the address to the brethren of the lodge by John Roberts, all the addresses again being delivered in an excellent, confident and proficient manner. With the ceremony being completed, John brought the warmest and sincere personal greetings and congratulations to Iain from the Provincial Grand Master Tony Harrison. John then thanked and congratulated Ian for the excellent ceremony he had performed and all the brethren who had taken part. 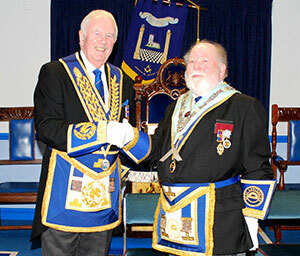 Iain’s very first duty as master was a pleasant one, as Iain had the privilege to present cheques to John on behalf of the lodge for charities. £150 to the MCF 2021 Festival and £150 for West Lancashire Freemasons’ Charity (WLFC), John thanked the brethren of lodge on behalf of the recipients for their admirable donations. Once the lodge was closed, the brethren retired to the dining room for an excellent festive board, during which a raffle was held which raised £102 with the proceeds to be given to the lodge’s widows fund. Pictured from left to right, are: Ray Barrow, Graham Chambers, John Roberts, Iain Beckett, Ian Gee and Malcolm Alexander.